My mom swears by using facial wipes as her sole method of cleansing. This is not a good idea. 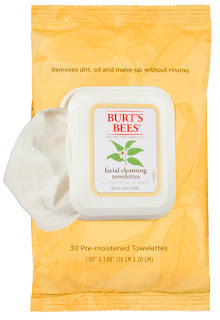 Facial wipes are a life saver when you are too tired, tipsy, even sometimes too lazy, to wash your face but they do not give a deep enough clean for regular use. That said, if you come home in the wee hours of the morning after a long night of clubbing - use your wipes. If you've worked an endless day on the job and all you want to do is get into your pajamas at 6pm - use your wipes. Just be sure to use really good wipes. All wipes are not created equal so be picky about what use use. Be very picky. I say Burt's Bee's Facial Cleansing Towelettes With White Tea Extract are the cheapest and the best. They are nice and juicy, giving a scrupulous clean where you can see the dirt come off on the wipe (not something that will happen with those dry wipes). They are gentle with cucumber extract, extremely light in natural fragrance, and even the cloth itself is FSC natural certified fabric. Next time you are at the drugstore buying your toothpaste and deodorant grab a pack of these. Or maybe Josie Maran Bear Naked Wipes are the best. 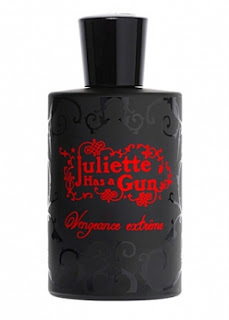 They are ultra gentle, the perfect velvety moistness, and perhaps the best at removing eye makeup. There is absolutely no artificial crap in these biodegradable wipes and even better, some of the proceeds go to helping save the polar bear population. Do something good for both yourself and the planet. Skincare aficionados will appreciate Ole Henriksen Truth To Go Wipes. Packed with anti-aging, hydrating ingredients like essential fatty acids, vitamin C and algae, they truly nourish the skin. On top of that, the saturated towelettes give a satisfying clean and have a refreshing all natural vanilla/citrus scent. They are absolutely worth the $15 price tag because you know you will be doing something good for your skin. 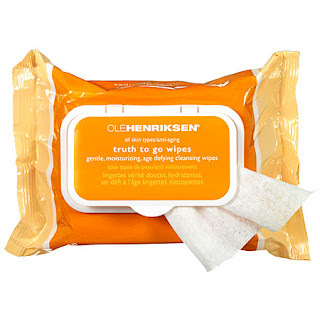 With any of these wipes you can feel safe knowing that they are all paraben, sulfate, and petrochemical free. Enjoy!